At this point, it’s a banal truism to point out that not all is as it seems in Mr. Robot. As anyone who watched the final few episodes of the first season can tell you, the USA techno-thriller thrived on reality-warping twists that prompted you to reconsider everything that you’d already watched. Darlene is … Elliot’s sister? Mr. Robot is … his dead dad? His dead dad is … Elliot? Given all those narrative loopty-loops, one can only assume that creator and director Sam Esmail has some more tricks planned for season two. We have a prediction about one. Spoilers below. In last night’s two-part season premiere, we see Elliot living a newly austere life. He appears to have moved in with his mother, cut himself off from his old digital stomping grounds, and isolated himself from virtually every character we’ve seen him interact with before. Our theory? Elliot isn’t living in his mom’s house at all. He’s actually in a psychiatric ward. (Some Redditors have a similar theory, though they’re leaning more toward it being a prison.) Esmail may be dropping these hints as red herrings, but if the theory proves true in the next few episodes, here’s how it would work. Elliot’s room is a hospital room. Elliot was never much of an interior decorator, but his new digs seem especially sparse, even for him. What, he couldn’t replace Qwerty? There’s almost nothing on the walls, everything’s perfectly arranged, and there’s no furniture other than a small desk, a chair, a nightstand, and a metal-framed twin bed. Speaking of which: a metal-framed twin bed? Isn’t that suspiciously medical? The spot could easily pass for a patient’s quarters. Elliot’s “mom” is a hospital employee. We saw Elliot’s mother a few times in the first season, but only ever in the form of his own illusions or memories: In the pilot, he sees her abusing him as a child; in the Times Square freak-out from the season finale, he sees her standing alongside his dad; and so on. In other words, we’ve never seen her in the flesh. Why should we expect that this version of his mama is any different? Indeed, in that aforementioned pilot moment, he explicitly ruled out the notion of ever going to his family to deal with his problems. What if the person giving him curt orders here is actually an orderly or a particularly gruff doctor? Think about what we hear her say in her brief moments of dialogue: “Time to get up,” she says with a morning frown; “See you in the morning,” she intones to conclude the day. Sounds a lot like the utilitarian, affectless interactions of someone in charge of monitoring and corralling patients. Leon, Hot Carla, and Ray are fellow patients. 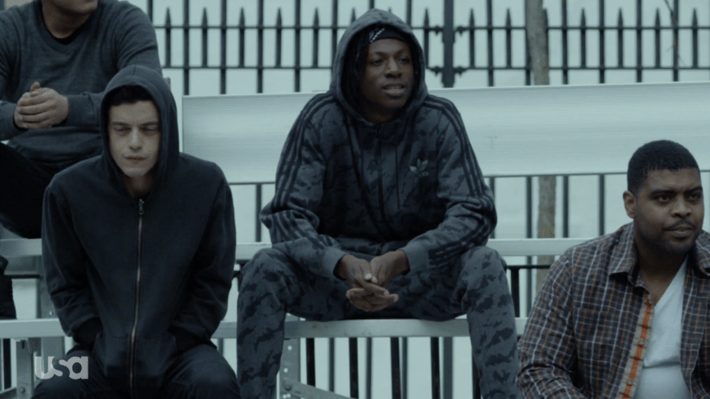 Joey Bada$$ is a gem of an addition to the show, appearing as Elliot’s new friend Leon, a dude who just discovered Seinfeld and wants to talk about it ad nauseam. They meet for breakfast at 8 a.m., lunch at 12 p.m., and dinner at 6 p.m. every day; Leon talks, Elliot (half-)listens. How on Earth would Elliot have found this guy? Think about the methods people usually have for meeting new chums: Elliot hates going to parties or bars, he isn’t using the internet, and he generally despises people. It would make all the sense in the world if Leon were just another patient, one who likes to wax poetic about whatever he saw in syndication during TV time in the psych ward. Elliot would never have had to seek this person out; he could just have decided not to turn him away when he started yapping one day. We don’t know much about another one of Elliot’s new acquaintances, “local pyro” Hot Carla, but someone primarily identified by a dangerous mental illness could definitely be a person in a ward, too. In addition to dining together, Elliot and Leon also attend a regular 2 p.m. pickup basketball game. Perhaps it’s one being played by patients during recreational hours? While watching the hoop-shooting, Elliot meets a husky and verbose gentleman by the name of Ray. Despite the fact that they’ve never met, Ray seems to know about Elliot’s proficiency with computers. Perhaps someone else found out about that and word spread within the ward? Ah, but Ray is where your theory falls apart, you may think, because how could a dog make it into a hospital? And what about the wife and home that Ray mentions? Hey, who’s to say any of that is real? Perhaps Ray suffers from the same kinds of delusions that affect Elliot, and he believes himself to be a free citizen living in domestic bliss, toting around an entirely imaginary dog. Leon and Elliot have their conversations in a hospital cafeteria. Leon and our dour protagonist have their little chats in a cafeteria-style restaurant where everybody seems to be eating their food on trays — a dining schema that would fit perfectly in a hospital. Easily one of the strangest parts of Elliot’s new routine is his regular visits to a “church group” two days a week. If we take Elliot at his word and he’s just living with his mom and trying to create a new routine, why the hell would this socially anxious misanthrope hang out with a motley crew of fellow humans? “I need to keep socializing myself; it’s good for me,” he says. But why would he suddenly decide that socialization is a priority? Perhaps this is his way of making a medical directive seem like his own initiative, and he’s actually just been told to attend group-therapy sessions to get a better handle on his brain. Elliot’s doctors got him to start journaling. It’s pretty standard practice for mental-health professionals to recommend that someone dealing with mental illness start keeping a diary. It’s a solid way to keep track of your ailments and seek insight. Given that Elliot never had a previous habit of leaving a paper trail of any kind, much less one where he blurted out his feelings, wouldn’t it stand to reason that a doctor gave him the idea to start? Elliot’s childhood flashback is an echo of his current circumstance. We’d already heard plenty of times about lil’ Elliot’s spill from a bedroom window at the hands of his late father. So why do we need to see it acted out here? Perhaps it’s because Elliot’s brain is trying to work through his delusions and is giving him a hint about his real circumstances by reminding him of his post-fall hospital visit. Plus, at the end of the scene, we pan to X-ray images of Elliot’s brain, then are thrust into our first scene of him in his new room, whooshed along by a music cue that begins with the word daydream. Krista is seeing Elliot again only because he’s under hospital supervision. When we last saw Elliot’s therapist, the much-put-upon Krista Gordon, she wasn’t on terribly good terms with the lad. He’d revealed that he had hacked her, and they ended their sessions. But now, surprisingly, she’s back on the scene, talking to Elliot about his loneliness and hatred of the world. “Elliot, it took a lot for me to talk to you after what you did,” she says. “But I agreed, with the condition that you were going to be more open with me.” Perhaps, upon being hospitalized, Elliot requested that he be reunited with the only mental-health professional who ever came close to understanding him. She would have been reluctant, but might have been swayed by the fact that Elliot’s care was stepping up, meaning he can’t get up to his old shenanigans. The chat with Gideon was done in a hospital meeting room. Wasn’t there something stilted about the staging of Elliot’s little tête-à-tête with his old boss at his “mom’s house”? The pair are seated at opposite ends of a sparse table devoid of refreshments or comfortable furniture. Elliot’s mom looks over at one point when things get heated and asks, “What’s going on over there?” Feels a lot like visiting hours in a medical facility. Tyrell and Elliot are able to get in touch because Tyrell is the one who put Elliot in the hospital. If our little theory proves true, it still leaves a big question: How did our hacker hero end up in this controlled environment? It’s certainly possible that he admitted himself on an entirely voluntary basis, which would fit with the voice-over’s narrative about how he needed to escape from the wackiness that had enveloped him. But what if someone brought him there? 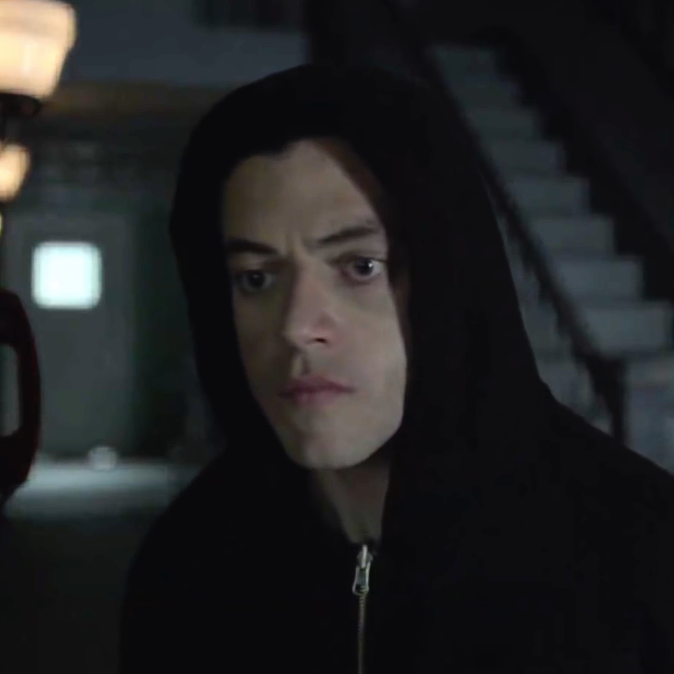 Elliot spent much of the season-one finale trying to figure out where Tyrell Wellick was, and it stands to reason that he could’ve been the one knocking on Elliot’s door at the end of last season. What if he arrived and got him committed? That would explain why, in this episode’s final scene, Tyrell and Elliot are able to have that phone conversation, despite Elliot allegedly being removed from the digital ecosystem. Maybe all Elliot had to do was ask a nurse to get him in touch with the guy who checked him in (a request that, given his dissociative episodes, he could entirely forget right afterward) and the would-be CTO of E Corp was on the horn just moments later. A few visual cues suggest the setting. On the basketball court, we repeatedly see shots where the tiers of the bleachers and the bars of the fence fill the screen, conveying a prisonlike image. Perhaps this medical facility is one that heavily prevents patients from escaping? 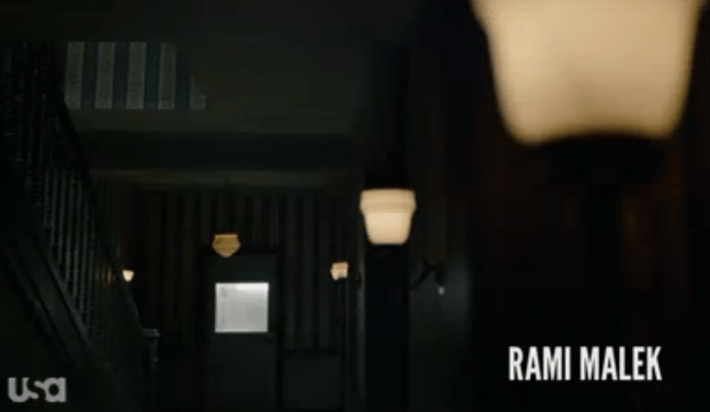 And in the “mom’s house” shots, there (a) are a lot more lighting fixtures along the hallways than one might expect in a private home and (b) is a door at the back end of the front hall with white paint and a square window near its top, making it look a little hospital-ish. These cues might be a stretch, but Esmail is a big Kubrick junkie — you should never assume any visual detail is an accident. The season’s tagline gives away the secret. Elliot scribbles the phrase “I am in control” over and over again in his journal. Season two’s tagline? “Control is an illusion.” Simple math, using the term “is” as an equals sign: If “control” = “an illusion,” substitution leaves us with the sentence “I am in an illusion.” Honestly, this is a sign of the health-care system working: The safest place to live out an illusion is in the sterilized halls of a psychiatric ward.